1582 by José Ortiguera and others (first recorded ascent of Guagua Pichincha). Pichincha is an active stratovolcano in the country of Ecuador, whose capital Quito wraps around its eastern slopes. The two highest peaks of the mountain are Wawa Pichincha (Kichwa wawa child, baby / small, Hispanicized spelling Guagua Pichincha) (4,784 metres (15,696 ft)) and Ruku Pichincha (Kichwa ruku old person, Hispanicized Rucu Pichincha) (4,698 metres (15,413 ft)). The active caldera is in Wawa Pichincha on the western side of the mountain. Both peaks are visible from the city of Quito and both are popular acclimatization climbs. Wawa Pichincha is usually accessed from the village of Lloa outside of Quito. Ruku is typically accessed from the TelefériQo on the western side of Quito. In October 1999, the volcano erupted and covered the city with several inches of ash. Before that, the last major eruptions were in 1553 and in 1660, when about 30 cm of ash fell on the city. The province in which it is located takes its name from the mountain, as is the case for many of the other provinces in Ecuador (including Cotopaxi, Chimborazo, and Imbabura). 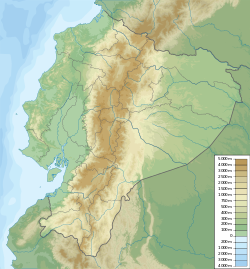 In 1660, Pichincha underwent a Plinian eruption, spreading ash over 1,000 kilometres (620 mi), with over 30 centimetres (12 in) of ash falling on Quito. The most recent significant eruption began in August 1998. On March 12, 2000, a phreatic eruption killed two volcanologists who were working on the lava dome. The first recorded ascent of Guagua Pichincha was in 1582 by a group of locals led by José Ortiguera. In 1737 several members of the French Geodesic Mission to the Equator, including Charles-Marie de La Condamine, Pierre Bouguer and Antonio de Ulloa, spent 23 days on the summit of Rucu Pichincha as part of their triangulation work to calculate the length of a degree of latitude. On 17 June 1742, during the same mission, La Condamine and Bouguer made an ascent of Guagua Pichincha and looked down into the crater of the volcano, which had last erupted in 1660. La Condamine compared what he saw to the underworld. On May 24, 1822, General Sucre's southern campaign in the Spanish-American war of independence came to a climax when his forces defeated the Spanish colonial army on the southeast slopes of this volcano. The engagement, known as the Battle of Pichincha, secured the independence of the territories of present-day Ecuador. ^ a b c "Guagua Pichincha". Global Volcanism Program. Smithsonian Institution. ^ a b Rachowiecki, Rob; Wagenhauser, Betsy (1997). Climbing & Hiking in Ecuador (4th ed.). Bradt. p. 91. ISBN 1898323542. ^ a b Fabián Potosí, C; et al. (2009). Kichwa Yachakukkunapa Shimiyuk Kamu, Runa Shimi - Mishu Shimi, Mishu Shimi - Runa Shimi (Kichwa-Spanish dictionary). Quito: Ministerio de Educación del Ecuador. ^ Hall, Minard (1977). El Volcanismo en el Ecuador (in Spanish). Sección Nacional del Ecuador. ^ Kington, John A. (2010). Climate and Weather. London: Harper Collins. ISBN 9780007185016. ^ "Guagua Pichincha Volcano". Volcano Discovery. Retrieved 2018-04-19. ^ "Guagua Pichincha Volcano". Volcano Live. Retrieved 2018-04-19. ^ Ulloa, Antonio de (1806). A voyage to South America: describing at large the Spanish cities, towns, provinces, &c. on that extensive continent. John Stockdale, R. Faulder, Longman, Lackington and J. Harding. p. 214. Retrieved November 9, 2017. ^ Ferreiro, Larrie (2011). Measure of the Earth: The Enlightenment Expedition that Reshaped Our World. Basic Books. p. 215. Wikimedia Commons has media related to Pichincha (volcano). This Ecuador location article is a stub. You can help Wikipedia by expanding it. This page was last edited on 18 February 2019, at 14:30 (UTC).